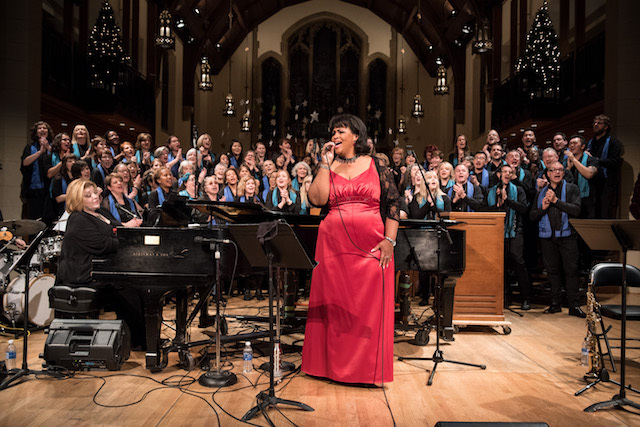 Good Noise Vancouver Gospel Choir (“Good Noise”) presents their beloved sell-out holiday concert, Good Tidings! A Good Noise Gospel Christmas, December 14 & December 15 at Christ Church Cathedral and December 17 at St. John’s Shaughnessy. Tickets are available for $30 (adults), $25 (students/seniors), $10 (children 12 and under). Book online now or by calling 1-800-838-3006. Holiday hits abound as the concert features a delightful mix of audience favourites in dazzling new arrangements, including a powerfully moving rendition of O Holy Night. Good Noise and Maureen will then join forces in a tribute to Aretha Franklin with a Christmas arrangement of the gospel song, Walk In the Light, featured on both her 1987 gospel album and at her funeral earlier this year. To complete the set list, the choir will perform the vibrant and joyful Amen, written by a pioneer of gospel music, Jester Hairston. Good Noise will also premiere a hand-clapping, foot-stomping arrangement of Everybody Knows it’s Christmas by gospel great Israel Houghton. Returning to the concert stage after thrilling audiences last year will be the Staple Singers classic Who Took the Merry out of Christmas and Joy To The World, in an arrangement made famous by Whitney Houston in the 1996 film The Preacher’s Wife. I will draw one winner at random from all entries at 12:00pm on Tuesday, December 4, 2018. Follow Good Noise on Facebook, Twitter, and Instagram for more information. Update The winner is Kate Choi! Would love to check out this concert! Sounds amazing! What a wonderful Christmas date night! Winning this would be incredible and much appreciated!! This mine and my husband’s first Christmas alone together before our sweet baby arrives next year. This would be such a lovely evening night out. Thank you. This would be a great concert for getting into the Christmas spirit. Sounds like a magical evening. This’d be a fun night out. What a great date night option! I love Christmas music. Love to go. Wow, this would be such a great night out! Better than listening to Trump. My mom would be my date- she’d love to see this show! Would love this pre Christmas treat! Sounds like an incredible evening of Holiday Bliss! Great event to enjoy the season! It sounds like a great performance! Looks like a great event to celebrate Christmas, thanks for the opportunity! This sounds like a fantastic night out! Should be a festive fun performance. Entered and liked for this wonderful contest.